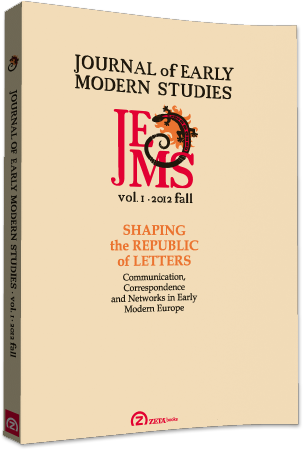 The new Journal of Early Modern Studies has launched with a special issue on Shaping the Republic of Letters: Communication, Correspondence, and Networks in Early Modern Europe. Edited by the Foundations of Modern Thought Research Centre at the University of Bucharest, and featuring our very own Howard Hotson on its Advisory Board, the new publication is billed as a ‘an interdisciplinary, peer-reviewed journal of intellectual history, dedicated to the exploration of the interactions between philosophy, science, and religion in Early Modern Europe’. The epistolary opener features seven contributions (as well as related review essays and book reviews) on particular correspondents and correspondence networks, including an article by Noel Golvers on Sino-European exchanges in the seventeenth and eighteenth centuries; Noel initiated our seminar series in 2010 with a wonderful paper on this topic (listen to the podcast). For full details and to order your copy, visit the journal webpage.